This article is about Shakespeare's play. For other uses, see Comedy of errors (disambiguation). Set in the Greek city of Ephesus, The Comedy of Errors tells the story of two sets of identical twins who were accidentally separated at birth. Antipholus of Syracuse and his servant, Dromio of Syracuse, arrive in Ephesus, which turns out to be the home of their twin brothers, Antipholus of Ephesus and his servant, Dromio of Ephesus. When the Syracusans encounter the friends and families of their twins, a series of wild mishaps based on mistaken identities lead to wrongful beatings, a near-seduction, the arrest of Antipholus of Ephesus, and false accusations of infidelity, theft, madness, and demonic possession. Because a law forbids merchants from Syracuse to enter Ephesus, elderly Syracusian trader Egeon faces execution when he is discovered in the city. He can only escape by paying a fine of a thousand marks. He tells his sad story to Solinus, Duke of Ephesus. In his youth, Egeon married and had twin sons. On the same day, a poor woman without a job also gave birth to twin boys, and he purchased these as slaves to his sons. Soon afterward, the family made a sea voyage and was hit by a tempest. Egeon lashed himself to the main-mast with one son and one slave, and his wife took the other two infants. His wife was rescued by one boat, Egeon by another. Egeon never again saw his wife or the children with her. Recently his son Antipholus, now grown, and his son's slave Dromio left Syracuse to find their brothers. When Antipholus did not return, Egeon set out in search of him. The Duke is moved by this story and grants Egeon one day to pay his fine. That same day, Antipholus arrives in Ephesus, searching for his brother. He sends Dromio to deposit some money at The Centaur, an inn. He is confounded when the identical Dromio of Ephesus appears almost immediately, denying any knowledge of the money and asking him home to dinner, where his wife is waiting. Antipholus, thinking his servant is making insubordinate jokes, beats Dromio of Ephesus. Dromio of Ephesus returns to his mistress, Adriana, saying that her "husband" refused to come back to his house, and even pretended not to know her. Adriana, concerned that her husband's eye is straying, takes this news as confirmation of her suspicions. Antipholus of Syracuse, who complains "I could not speak with Dromio since at first, I sent him from the mart," meets up with Dromio of Syracuse who now denies making a "joke" about Antipholus having a wife. Antipholus begins beating him. Suddenly, Adriana rushes up to Antipholus of Syracuse and begs him not to leave her. The Syracusans cannot but attribute these strange events to witchcraft, remarking that Ephesus is known as a warren for witches. Antipholus and Dromio go off with this strange woman, the one to eat dinner and the other to keep the gate. Antipholus of Ephesus returns home for dinner and is enraged to find that he is rudely refused entry to his own house by Dromio of Syracuse, who is keeping the gate. He is ready to break down the door, but his friends persuade him not to make a scene. He decides, instead, to dine with a courtesan. Inside the house, Antipholus of Syracuse discovers that he is very attracted to his "wife's" sister, Luciana of Smyrna, telling her "train me not, sweet mermaid, with thy note / To drown me in thy sister's flood of tears." She is flattered by his attention but worried about their moral implications. 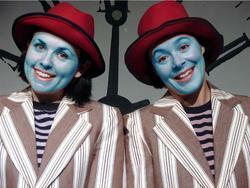 After she exits, Dromio of Syracuse announces that he has discovered that he has a wife: Nell, a hideous kitchen-maid. He describes her as "spherical, like a globe; I could find out countries in her". Antipholus jokingly asks him to identify the countries, leading to a witty exchange in which parts of her body are identified with nations. Ireland is her buttocks: "I found it out by the bogs". He claims he has discovered America and the Indies "upon her nose all o'er embellished with rubies, carbuncles, sapphires, declining their rich aspect to the hot breath of Spain; who sent whole armadas of cracks to be ballast at her nose." (This is one of Shakespeare's few references to America.) The Syracusans decide to leave as soon as possible, and Dromio runs off to make travel plans. Antipholus of Syracuse is then confronted by Angelo of Ephesus, a goldsmith, who claims that Antipholus ordered a chain from him. Antipholus is forced to accept the chain, and Angelo says that he will return for payment. An 1816 watercolor of Act IV, Scene i: Antipholus of Ephesus, an officer, and Dromio of Ephesus. Antipholus of Ephesus dispatches Dromio of Ephesus to purchase a rope so that he can beat his wife Adriana for locking him out, then is accosted by Angelo, who tells him "I thought to have ta'en you at the Porpentine" and asks to be reimbursed for the chain. He denies ever seeing it and is promptly arrested. As he is being led away, Dromio of Syracuse arrives, whereupon Antipholus dispatches him back to Adriana's house to get money for his bail. After completing this errand, Dromio of Syracuse mistakenly delivers the money to Antipholus of Syracuse. The Courtesan spies Antipholus wearing the gold chain, and says he promised it to her in exchange for her ring. The Syracusans deny this and flee. The Courtesan resolves to tell Adriana that her husband is insane. Dromio of Ephesus returns to the arrested Antipholus of Ephesus, with the rope. Antipholus is infuriated. Adriana, Luciana, and the Courtesan enter with a conjurer named Pinch, who tries to exorcize the Ephesians, who are bound and taken to Adriana's house. The Syracusans enter, carrying swords, and everybody runs off for fear: believing that they are the Ephesians, out for vengeance after somehow escaping their bonds. Adriana reappears with henchmen, who attempt to bind the Syracusans. They take sanctuary in a nearby priory, where the Abbess resolutely protects them. Suddenly, the Abbess enters with the Syracusan twins, and everyone begins to understand the confused events of the day. Not only are the two sets of twins reunited, but the Abbess reveals that she is Egeon's wife, Emilia of Babylon. The Duke pardons Egeon. All exit into the abbey to celebrate the reunification of the family. The play is a modernized adaptation of Menaechmi by Plautus. As William Warner's translation of the classical drama was entered into the Register of the Stationers Company on 10 June 1594, published in 1595, and dedicated to Lord Hunsdon, the patron of the Lord Chamberlain's Men, it has been supposed that Shakespeare might have seen the translation in manuscript before it was printed – though it is equally possible that he knew the play in the original Latin, as Plautus was part of the curriculum of grammar school students. The play contains a topical reference to the wars of succession in France, which would fit any date from 1589 to 1595. Charles Whitworth argues that The Comedy of Errors was written "in the latter part of 1594" on the basis of historical records and textual similarities with other plays Shakespeare wrote around this time. The play was not published until it appeared in the First Folio in 1623. For centuries, scholars have found little thematic depth in The Comedy of Errors. Harold Bloom, however, wrote that it "reveals Shakespeare's magnificence at the art of comedy", and praised the work as showing "such skill, indeed mastery--in action, incipient character, and stagecraft--that it far outshines the three Henry VI plays and the rather lame comedy The Two Gentlemen of Verona". Stanley Wells also referred to it as the first Shakespeare play "in which mastery of craft is displayed". The play was not a particular favourite on the eighteenth century stage because it failed to offer the kind of striking roles that actors such as David Garrick could exploit. The play was particularly notable in one respect. In the earlier eighteenth century, some critics followed the French critical standard of judging the quality of a play by its adherence to the classical unities, as specified by Aristotle in the fourth century BC. The Comedy of Errors and The Tempest were the only two of Shakespeare's plays to comply with this standard. Law professor Eric Heinze, however, claims that particularly notable in the play is a series of social relationships, which is in crisis as it sheds its feudal forms and confronts the market forces of early modern Europe. Two early performances of The Comedy of Errors are recorded. One, by "a company of base and common fellows", is mentioned in the Gesta Grayorum ("The Deeds of Gray") as having occurred in Gray's Inn Hall on 28 December 1594. The second also took place on "Innocents' Day", but ten years later: 28 December 1604, at Court. In 1734, an adaptation called See If You Like It was staged at Covent Garden. Drury Lane mounted a production in 1741, in which Charles Macklin played Dromio of Syracuse – in the same year as his famous breakthrough performance as Shylock. In the 1980s, the Flying Karamazov Brothers performed a unique adaptation of this play at the Lincoln Center in New York; it was shown on MTV and PBS. In 2017, a two-woman clowning adaptation called 15 Villainous Fools played in New York City at the People's Improv Theater. On 27 December 1786, the opera Gli equivoci by Stephen Storace received its première at the Burgtheater in Vienna. The libretto, by Lorenzo da Ponte, follows the play's plot fairly closely, though some characters were renamed. Frederic Reynolds staged an operatic version in 1819, with music by Henry Bishop supplemented with some songs by Mozart and Arne. 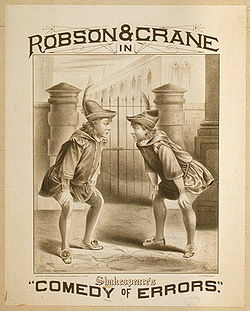 Various other adaptations were performed down to 1855 when Samuel Phelps revived the Shakespearean original at Sadler's Wells Theatre. The Czech composer Iša Krejčí's 1943 opera Pozdvižení v Efesu (Turmoil in Ephesus) is also based on the play. The play has been adapted as a musical at least three times, first as The Boys from Syracuse with a score by Richard Rodgers and Lorenz Hart, then in 1976 in a version by Trevor Nunn, scored by Guy Woolfenden, for the Royal Shakespeare Company, winning the Laurence Olivier Award for best musical on its transfer to the West End in 1977, and in 1981 as Oh, Brother! with a score by Michael Valenti and Donald Driver. A hip-hop musical adaptation, The Bomb-itty of Errors, won 1st Prize at HBO's Comedy Festival and was nominated opposite Stephen Sondheim for the Best Lyrics Drama Desk Award in 2001. In India, Ishwar Chandra Vidyasagar adapted Shakespeare's play in his Bengali novel Bhranti Bilash (1869). Vidyasagar's efforts were part of the process of championing Shakespeare and the Romantics during the Bengal Renaissance. The film Big Business (1988) is a modern take on A Comedy of Errors, with female twins instead of male. Bette Midler and Lily Tomlin star in the film as two sets of twins separated at birth, much like the characters in Shakespeare's play. Double Di Trouble (2014 Punjabi Film) directed by Smeep Kang and starring Dharmendra, Gippy Grewal. Local Kung Fu 2 (2017 Assamese martial arts film). In 1940 the film The Boys from Syracuse was released, starring Alan Jones and Joe Penner as Antipholus and Dromio. It was a musical, loosely based on "Comedy of Errors". Roger Daltrey played both Dromios in the BBC complete works series directed by James Cellan Jones in 1983. A two-part TV adaptation was produced in 1978 in the USSR, with a Russian-Georgian cast of notable stage actors. In the Yes Prime Minister episode "The Patron of the Arts" Prime Minister James Hacker complains that "they [the National Theatre] set The Comedy of Errors in Number 10 Downing Street". ^ "Definition of COMEDY OF ERRORS". www.merriam-webster.com. ^ Charles Walters Whitworth, ed., The Comedy of Errors, Oxford, Oxford University Press, 2003; pp. 1–10. ^ Bloom, Harold, ed. (2010). The Comedy of Errors. Infobase Publishing. ISBN 1438134401. ^ Bloom, Harold. "Shakespeare: The Comedy of Errors". The New York Times. Retrieved May 5, 2018. ^ Billington, Michael (2014-04-02). "Best Shakespeare productions: The Comedy of Errors". the Guardian. Retrieved 2018-05-15. ^ Bloom, Harold (2010). Marson, Janyce, ed. The Comedy of Errors. Bloom's Literary Criticism. New York: Infobase. p. 57. ISBN 978-1-60413-720-0. It is noteworthy that The Comedy of Errors and Shakespeare's last play, The Tempest, are the only two plays that strictly adhere to the classical unities. ^ The identical dates may not be coincidental; the Pauline and Ephesian aspect of the play, noted under Sources, may have had the effect of linking The Comedy of Errors to the holiday season—much like Twelfth Night, another play secular on its surface but linked to the Christmas holidays. ^ Smith, Matt. "Review: 15 Villainous Fools". Stage Buddy. Stage Buddy. Retrieved 10 March 2019. ^ Holden, Amanda; Kenyon, Nicholas; Walsh, Stephen, eds. (1993). The Viking Opera Guide. London: Viking. p. 1016. ISBN 0-670-81292-7. ^ F. E. Halliday, A Shakespeare Companion 1564–1964, Baltimore, Penguin, 1964; p.112. ^ "The Bard in Bollywood - The Hindu". archive.is. 2 September 2014. Archived from the original on 2 September 2014. O'Brien, Robert Viking (1996). "The Madness of Syracusan Antipholus". Early Modern Literary Studies. 2 (1): 3.1–26. ISSN 1201-2459. The Comedie of Errors – HTML version of this title. This page was last edited on 26 March 2019, at 01:48 (UTC).